Parts claimed to be from Apple's sixth-generation iPhone continue to surface, with the latest components showing a headphone jack, earpiece and Wi-Fi cable claimed to be from a future iPhone. The parts surfaced this week on the website of parts supplier SW-Box, and were highlighted by How To Arena. The purported iPhone part suggests the device will have a significantly different internal design, as the headphone jack is attached to the earpiece and Wi-Fi components. That's a major departure from the current design of the iPhone 4S and iPhone 4, in which the headphone jack is included on a component with the handset's volume buttons and mute switch, all of which are located in the upper left corner of the device. The site claims the new component is compatible only with an "iPhone 5" device, and claims the cable is "clearly for the new iPhone." The component can be purchased for $7.71. The same site showed off a SIM tray claimed to be from Apple's next-generation iPhone earlier this month. 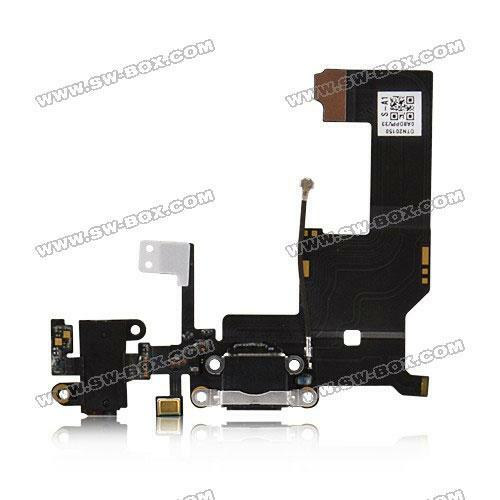 That component sported subtle differences when compared to the SIM tray design found in the iPhone 4S and iPhone 4. And last month, pictures of a new home button claimed to be for Apple's next iPhone surfaced online. That part suggested the next iPhone's home button will look largely the same as it always had, but also gave an indication that the part will be redesigned internally. In March it was said that Apple was reviewing potential components for the new iPhone, which is expected to be released this fall, one year after the iPhone 4S. Rumors have suggested the new device will feature a redesigned exterior that will be a significant departure from the form factor of the iPhone 4S and iPhone 4.